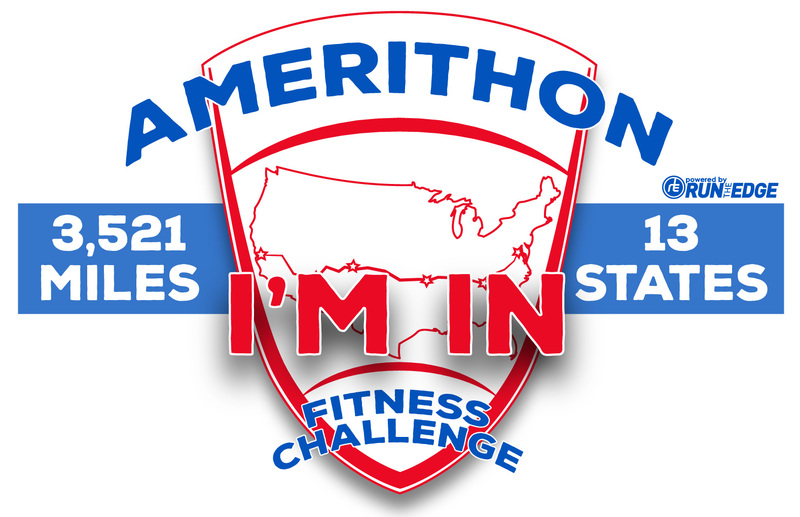 Yesterday, I happened across and signed up for the Amerithon Challenge. It's a virtual run/ride/swim/ - whatever, across the breadth of the USA; over 3,500 miles! I'm hoping to finish it before my 70th birthday!! are brilliantly put together with musical accompaniment. Watching a couple of them was really motivating for me and I thought it would be a good opportunity to learn more about the USA as I work my way along the route. You can see one of the videos on the site. There's also a private Facebook group. So this morning I celebrated my new challenge by running further than I've done for a couple of years - 15k! To say that I'm tired now is a bit of an understatement as I hardly slept last night, the latest in a run of bad nights for sleeping. I think I can almost guarantee a better sleep tonight. I ran the 15k at a very slow pace. I've decided to do some very slow long runs to practice and Ultra pace. Not that I'll ever be able to do and ultra, but you never know - unless you try. More about Amerithon and ultras as I go along. 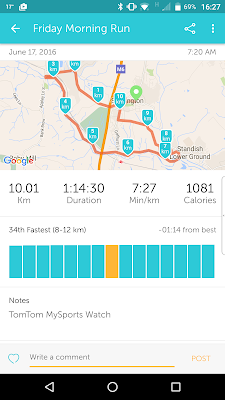 A couple of Sundays ago I did an unintentional road 10k. 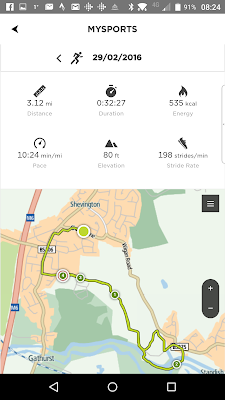 It was the first proper road run I'd done in ages. But to run so far was unintentional. I was trying my Sole footbeds in my Inov-8 road shoes which have just a 6mm heel to toe drop. I hadn't had them on for quite a while so wondered how I'd get on. But they were just great with the footbeds. So much so that at my usual point for turning for home I felt I just wanted to carry on running, so I did. My total run was 10k and it was the best time this year by half a minute, which on the face of it doesn't seem so much but it was a much more undulating route and much higher total climb than my previous 10k pb this year. Saturday just gone I thought I'd just push out a bit and extended one of my mixed trail with a bit of road 10k routes a bit to 7.5 miles. 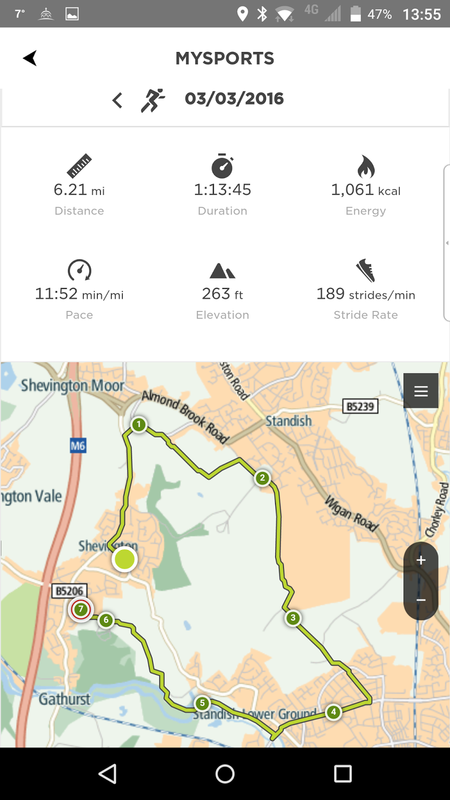 It was the furthest I'd run for a long time, maybe 2 years. I was happy but tired when I finished and I've taken a couple of days rest. For the next couple of runs I'll do short ones. Then maybe something different again next weekend. I've a couple of things in mind. One a longer mixed run, the other a 5 mile race. It depends how I'm feeling towards the weekend. Race or longer leisure run? 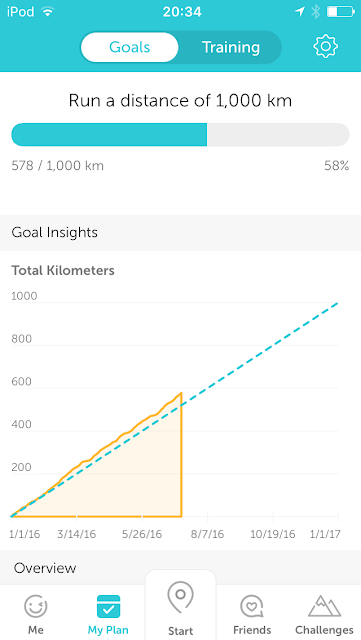 My Runkeeper total on 9th July - On Target! 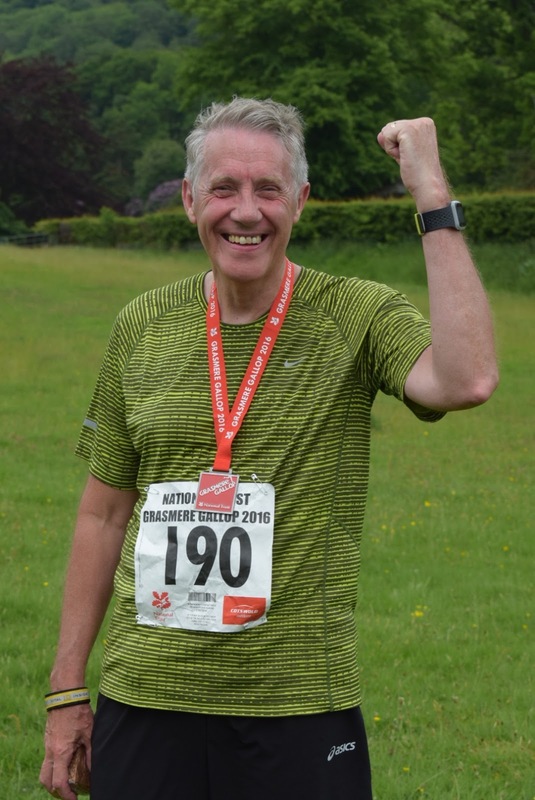 This morning I did 10k and got to the half way point in the Virtual Runner UK 1000 Challenge. I congratulated myself on a job well done - or a job half finished that is. My aim now is to finish by the beginning of December which means I'll have to do a few additional ks above my average up to now. And it's no bad thing. 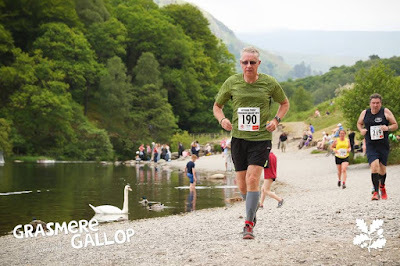 After two years of waiting I finally got to run in and finish the Grasmere Gallop last Saturday, 4th June. I missed last year because I was ill and in 2014 I'd promised to be elsewhere on the day of the race. It was harder than I'd anticipated but well worth the effort. Very well organised and a good day, quite warm but not too much blazing sunshine. Just one hiccup - I thought I'd started my watch but pressed the rocker the wrong way. I was a couple of minutes into the race before I realised, so it clocked 5.9 miles in 1.15. A very good weekend. Hope to repeat it next year. That's the first third of the year completed today and I'm just over a third the way to the 1,000k. Very satisfactory! I wasn't so confident a month ago because I'd overstretched myself trying to get a 5k PB for my Virtual Running Co. March medal. Result - mild shin splints. But I never get injuries!!! I thought. It was the pushing too hard of course. So I had a week off and massaged my ankles and shins with vapour rub - yes, vapour rub. I'd read somewhere that it's good for muscle soreness. It seemed to help and it cleared my nose a bit too! It was just about the time I'd decided to stop taking pain killers. You know, Co-codamol and Ibuprofen, which I believe is affectionately known as 'Vitamin i' in the USA. It's so easy to just take them for every little ache and pain and especially to take advantage of ibuprofen's NSAID properties. Well, I didn't cave in and haven't now for 40 days and 40 nights (a Biblical 'long time') and I have to say that I feel better for not taking them. Over the last 3 or 4 days though I've applied some ibuprofen gel to my ankles where I've felt a twinge, just a twinge now. My shins are very much better and I'll stop using the gel between now and next weekend. And I've also begun to pay much more attention to running form. More about that in another post. But already, the results are remarkable. But being at this point of my 1,000k year, it's the time when I have to dig in and just get on with it. I'm a long way from the start in January but even further from the finish in December. It's easy to give up. And that's why it's important for me to go for those 'journey goals' of virtual and other race medals along the way. What's important is for me is to make the most of where I am now and enjoy the present. For it's in the present where we can improve in our running in whatever way we. want to. The medal comes at the end, and it's own delight with the sense of accomplishment. But, especially over the course of almost a whole year, there's so much more to delight in and feel accomplished about. Most of the joy is in the journey if we are able to appreciate it. And the end has its own special feeling. The road bits of the run are straightforward but I'd forgotten how uneven the trail parts are especially in mile 2 going uphill and in mile 3 coming down hill after the climb. It was really quite exhausting choosing secure footfalls and I had to move side to side quite a bit which began to play havoc with my left hip. So another lesson for me about how to stay out of hip discomfort -keep as straight a course as possible. I actually finished the run in my quickest 10k time this year; a minute faster than my last Virtual Running Co. 10k. But because of the difficulties underfoot, I think, I feel quite exhausted after it. Another lesson - on this route take my time on the long uphill going out section and conserve some energy for the faster down hill trail and then canal bank coming back. I'm quickly coming to understand that different routes require different tactics if I'm after better times for each of them. But of course, the biggest variable factor is body, mind and spirit; and it's best to as quickly as possible to determine how each of those feel and then tailor the run accordingly. I'd decided to have two days rest after my run on Saturday last. But then yesterday afternoon I realised that February 29th was coming around tomorrow and it wouldn't be here again for another 4 years. That year I will be 70 years old. So I couldn't let this 29th February go by without going for a run to mark it and hopefully next 29th February to see if I'm even still running!! 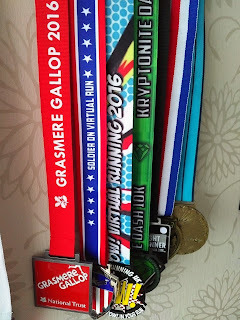 I chose to run a 5k in celebration of the day and I thought I'd rather like to have a medal to mark it. 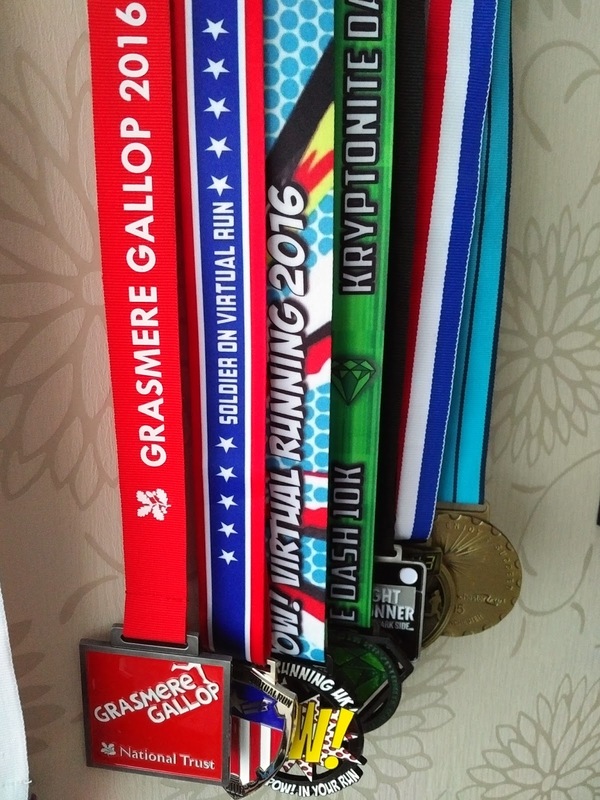 Virtual Runner UK's Leap Year medals had all gone. 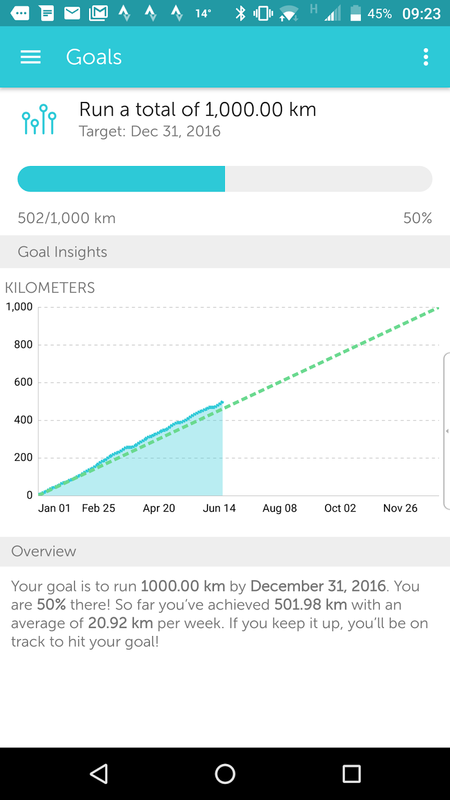 So I signed up for POW Virtual Running's POW! 2016 medal, which is an any time, any distance medal for the whole of the year. according to the Level Up 13.1 training plan Level 7 run which is - Run 15 Jog 3 Run 15 Jog 3. I thought that should help me cover it in a decent time and at the same time to do this next step of half marathon training. As it turned out, I beat my Personal Best for this route by a good 1min. 30 secs fairly steaming along the first 15 minutes and not losing very much at all in the following jog. I'd finished the run before I got to the second 'jog' stage. 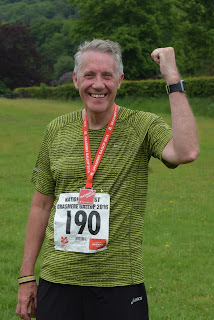 So I was very pleased with my effort this morning and I'll have a medal soon to mark it as well. I definitely feel I'm getting fitter and stronger as the weeks go by. I just have to watch I don't overdo it as I've done so much in the past, and get the rest days in.